﻿ Cassandra Claire "A mechanical angel"
The main > Books> Fantasy> Cassandra Claire "A mechanical angel"
The main character of the book "Mechanical Angel" — sixteen-year-old Theresa "Tess" Gray. Her parents died when she was three years old, and all the life of Tess lived in New York with the aunt Garriyet. After death of the aunt it should cross the Atlantic Ocean in search of the brother, Nathanael (Nate) who lives in London. Instead of the brother on sautgemptonsky pier she is met by Dark sisters, madam Darc and madam Blek. They tell to Tess that her brother could not arrive as he was detained by affairs, and asked them to see her to London. They give it the letter from Nathanael, and Theresa follows them, though not too willingly. Six weeks later we find it in captivity in Dark sisters from the secret organization "Underworld Club". They use its supernatural ability to accept appearance of other person, live or dead, holding in hand the thing belonging to him, and to learn thus foreign feelings and thoughts. But the young Twilight hunter rescues Tess from captivity, here and the real adventures begin. The girl finds existence of Nizhny Novgorod of the world where werewolves, vampires and other creations which most of people consider as an invention freely wander about streets. It should improve the unique abilities to find the brother. For this purpose Tess is compelled to unite with some Twilight hunters, differently her not to survive in this dangerous world. "Mechanical angel" and his continuation, "The mechanical prince", for certain will please all to whom the original and in details developed Universe of "Death tools", and also fans of an era of Queen Victoria and a stimpanka already managed to be fallen in love. Quotes from the book "Mechanical Angel"
"Always it is necessary to handle with books accurately, but especially with care it is necessary to treat their contents. Words can change a lot of things"
"To what, tell on favor, to arrange representation if nearby there is no viewer?" "Inanimate objects are really safe. But whether it is possible to tell the same about people who use them?" "The person should be judged not to that friends, and to how he treats servants say about him"
"People sometimes want to take control of something, essences of that do not understand. 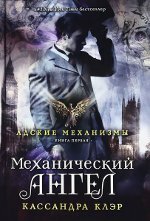 As a rule, it badly comes to an end"
Buktreyler of the novel "Mechanical Angel"
<Cassandra Claire "City of bones"